A few weeks ago, I was grousing about not having any pretty fall colors here in the Gulf South while all the more northern bloggers were displaying absolutely gorgeous photos of trees in all their autumnal glory. Well, we finally got some color for Thanksgiving. We have had enough cool weather to finally start the color process. 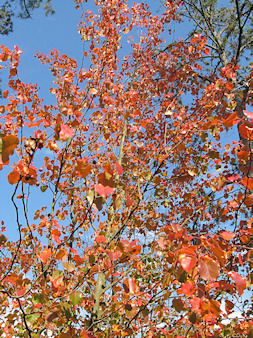 The Bradford pear tree went from green to orange in just about two days. With the bright blue skies that seemed to really set off the colors, this made up for not having the colors show up earlier. 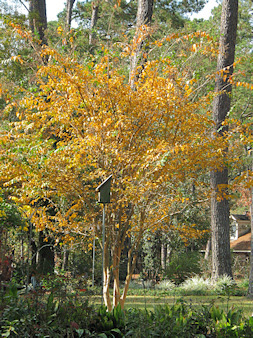 The crepemytle tree has turned a lovely golden color. We don’t have many trees that change color as you can see from the green in the background, so the ones that do change are extra special. I know that most bloggers farther north have already moved on to winter photos and are probably tired of the autumn colors by now, but come springtime, we southern bloggers will have a head start on spring flowers, so I guess it all evens out. Wednesday, as I was weeding out an area of the garden that contains some Louisiana irises, I came across a buried treasure. No, it wasn’t pirate treasure, but it was interesting. 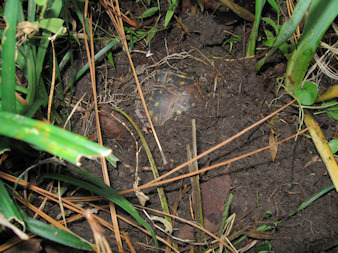 I found one of the turtles that has been crossing our paths for about twenty years half buried in the iris bed. I wrote about finding the turtles in the garden during the summer, but I have not seen them since about August. So on Wednesday, I just pulled out some weeds, and there he was. It is a good thing we don’t walk in the garden beds or this guy might have been squished. Only about half of his shell was visible, and there was a small opening where I could barely see his head. When I first ripped out the weeds above him, he did squirm a little, but then was still. I knew that frogs and turtles would bury themselves in the soil in winter time, but I thought that maybe it really didn’t get cold enough around here for them to do that. I guess, this proves I am wrong. It has not been that cold around here, only cool, but it seems that it was enough for this little guy to want to snuggle down in the mud to wait for warmer temperatures. After taking a photo of my little buried treasure, I carefully finished weeding around him, added some compost as a side dressing and then mulched the bed with pine straw. I hope this all made for an extra cozy winter bed for this turtle. Now, if I can only find where the other two turtles are settled in for the winter. 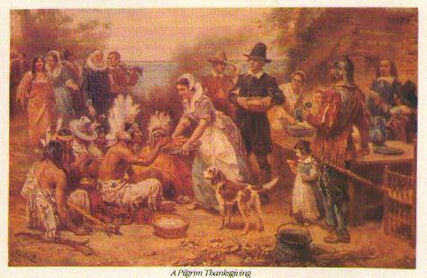 Wishing everyone a happy Thanksgiving. May you share your day with the ones you love. I am so thankful for my family which brings me so much joy, my health which allows me to garden without too many aches and pains, my home which brings me such peace and comfort, and my friends both here and in cyberspace. Now that winter is just around the corner and there are few plants flowering, there still are other things to bring a little color to a garden on dark, cold days. Berries. There are many plants around with colorful berries and as I walked around today, I was surprised at how many plants have berries still on them. 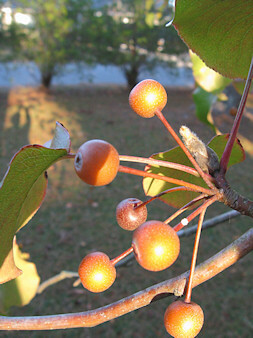 The Bradford pear is sporting ‘berries’ with autumnal colors. Very appropriate for Thanksgiving. 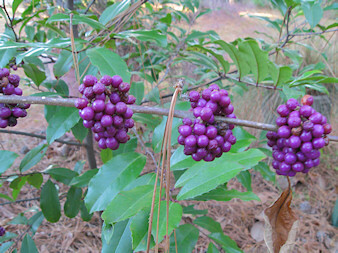 The Beauty Berry bush still has some magenta berries left though the birds should devour these soon. The bushes farther away from the house have all been stripped clean. 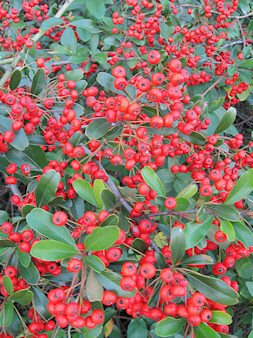 The pyracantha growing along a nearby road is loaded with bright orange-red berries. It won’t be long before the cedar waxwings come through and feast on them. The white berries on the tallow tree, which is finally showing some fall color, show why this tree has the nickname of popcorn tree. 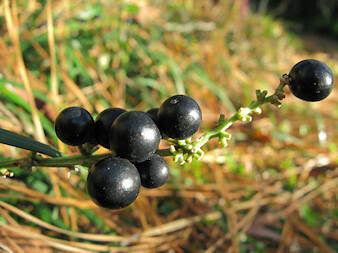 The wild privet has thousands of these black berries. 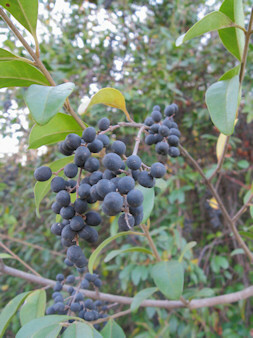 While the berries are attractive, the numbers show why I am constantly pulling up seedlings of this invasive tree. The glossy, black berry of the lirope reminds me of jet beads. 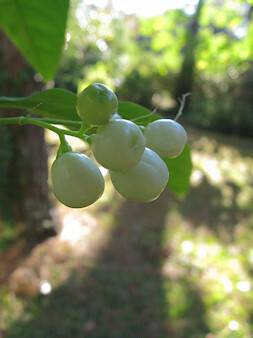 The white berries of the Night Blooming Jasmine bring an unusual colored berry to the garden. Too bad they don’t grow low to the ground like the lirope. The glossy black and white combination would be nice. Now to move on to the red and green combinations which are an anticipation of the Christmas season. 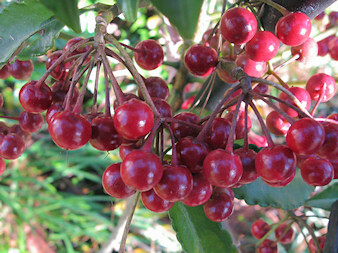 This Christmas Ardesia (above) keeps its red berries all year. And, this holly (below) has just started showing its little jewels. 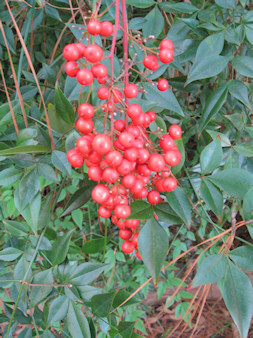 Nandina is another common plant but its red berries are welcomed come winter. 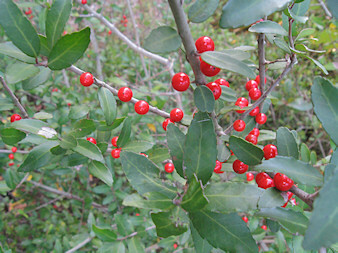 There still were a few berries around that I didn’t photograph – ligustrum, Bradford holly, and the rose hips which are just starting to turn colors. All these berries prove that flowers aren’t the only thing that brings color to a garden. I am trying out something new this year. Baby Duck yellow petunias. 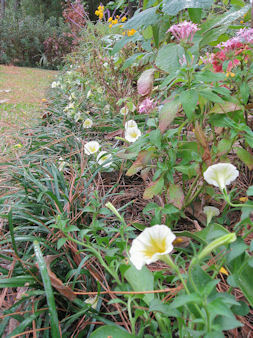 Here in the Gulf South, we use petunias as winter annuals. My sister had these petunias last year in her garden, and they were fantastic. These petunias have small flowers (1-1 1/2 inches), but the flowers are numerous. This is a spreading petunia, and if my sister’s experience is typical, these plants are vigorous and should be placed at least 15 inches apart. They are supposed to spread 3 feet and do require more frequent feedings than the typical petunia. But it is the masses of soft yellow flowers that is the real selling point. 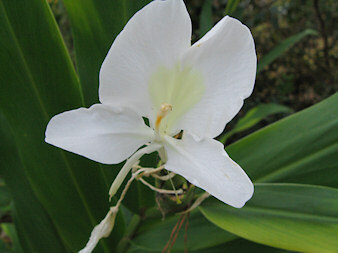 The trumpet shaped flowers have a yellow throat which fades to white at the flower’s edge. These are great in a hanging baskets or in a bed in the landscape. I planted mine in a bed where in the spring there will be mostly pink flowers, so I think these little petunias will look fine. Today, I had the day off and finally was able to get all my Baby Ducks in a row. Because our property has so many tall pine trees which makes most of the area, at best, partial shade, I do not grow many edibles. The few, that are grown, are in containers usually on the patio where there is more sun. One of the best I have grown is the bay leaf. I started out with just a seven inch plant and now the tree is about three feet tall. 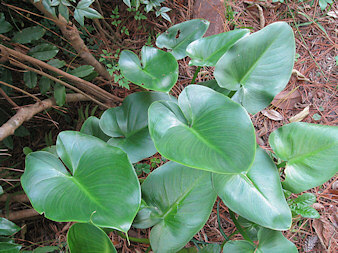 An evergreen, it is now just about the right size to start adding a little something to the garden. 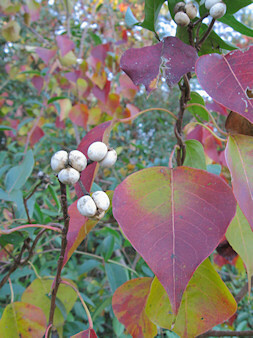 This culinary plant is an easy to grow but slow growing tree which eventually can reach up to 40 feet tall. I remember a neighbor of my parents had one and that tree must have been at least 2o feet tall. I think it will take my little guy a long time to reach that height at the rate it is growing now. I have plans to keep it pruned to shrub size. These plants take very well to pruning which is done in the spring. Of course, taking some leaves for cooking is also a form of pruning. It is recommended that for the first two years that leaves be taken only sparingly. These plants grow well in containers. Mine is still in a container, and I am still trying to decide if I want to plant it in the ground or not. I am thinking this would look nice in an urn shaped planter. That way, it would be easier to keep it pruned to a pyramid shape. It would also be more accessible to the kitchen if it was in a container. 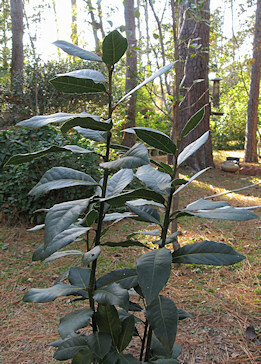 The Bay Laurel makes a great addition to cooking as well as the garden. Many culinary herbs are not the most attractive plants, but the Bay Leaf’s beautiful, shiny, dark green leaves makes it a handsome addition to the garden. 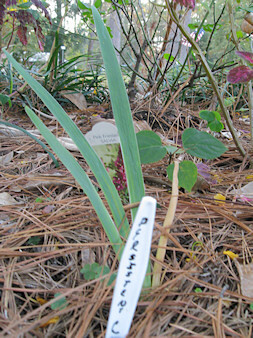 In September my sister and I received our order from Zydeco Iris which we promptly planted. 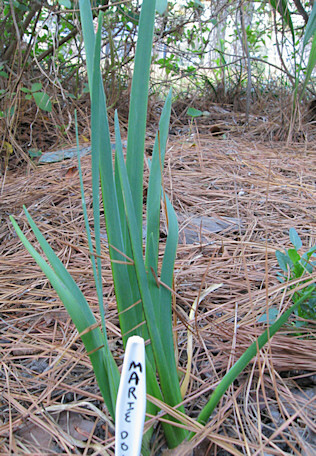 Louisiana Irises are planted in the fall after being dormant in the heat of the summer. I am happy to say that the irises are doing well after what I thought was a rocky start for two of them. Marie Dolors was described as being vigorous, and that turned out to be true. As soon as it was in the ground, new leaves started sprouting out. 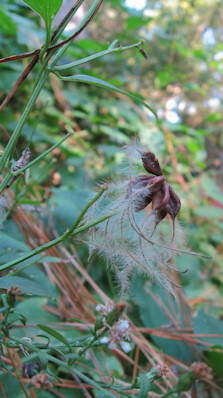 When this iris arrived, the leaves were few, small and about three inches high. Now, the foliage is almost twelve to fourteen inches high. This rhizome should produce some splendid white flowers in the spring. Another one I bought was a rose pink, Persistent Cuss, and it, too, has done well. While the plant is not as large as Marie Dolors, it is coming along nicely. 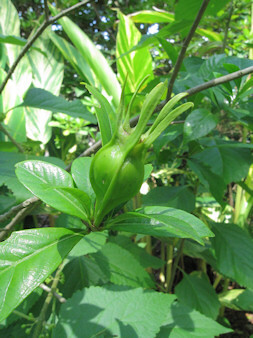 This one is also supposed to be vigorous once established. Two other ones that I bought, at first, did not seem to be doing as well as the above two. Poverty Point, a gorgeous medium rose pink, and Irish Bayou, a deep rose pink , lost all their leaves, and I thought they were lost. Poverty Point’s rhizome even looked yellow while Irish Bayou kept its green. Even so, I just kept watering these two hoping they would recover. Well, just the other day while walking around the garden, I was thrilled to see that Poverty Point has sprouted leaves in two places along the rhizome. So, it looks like that one has survived. Irish Bayou, still has no leaves, but the rhizome looks good, so maybe I am just a little too impatient for it to rebound. I feel certain that it should start to put out foliage any day. I can’t wait for spring to see these Louisiana Irises in bloom. It is hard to have new plants and have to wait for months before the flowers show up. Note: Happy birthday to a very special daughter. Somebody forgot to tell the tropicals that cold weather is here to stay. The last few days have been cold, and tonight there is a chance of a freeze. However, in our garden there are several microclimates that stay a little warmer, so I don’t think we actually will get down to freezing. If we do, it will only be for a very short time and not enough to damage anything. But, I know it won’t be long before that killing frost does hit, and there are still some tropical plants that are continuing to bloom even with our recent chilly temperatures. 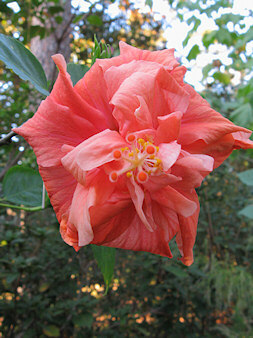 This peach hibiscus’s only response to the cold weather has been to start blooming in a darker color. 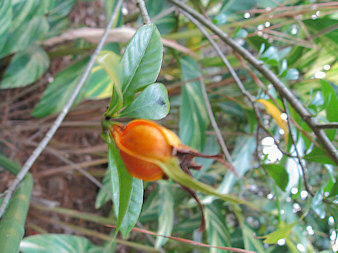 In the middle of summer, it is a much lighter peach. It is almost orange now. 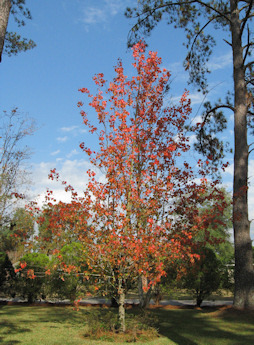 Could it be that it wants to get in on the seasonal color? This flower would be a perfect color for Thanksgiving table arrangement. When the real cold sets in, all the hibiscus plants will be cut back and placed in a covered area to wait for more hospitable temperatures. Another tropical still blooming is the butterfly ginger. While the flowers are not as plentiful as before, there are still enough flowers to perfume the garden. I think this is the longest they have bloomed since I planted them years ago. When they are finally done in by the cold weather, I just place a thick layer of mulch and wait for sprouts to show up in springtime. Finally, the calla lilies have returned from summer dormancy just in time to get nipped by a freeze. This happens every year. If they have not grown too tall by the time a freeze comes, I will cover them, but usually the bigger ones do get frozen back to the ground. This does not affect their blooming, thank goodness. With everything dying back, I’m glad these tropicals didn’t get the memo that winter with its cold weather is right on our doorstep. So, even though it is late autumn and many plants are dying back to wait out winter, some tropicals are still going strong and add welcome color, lushness, and life to the otherwise dormant garden.